Proud to be one of the most luxurious resorts in Cancun, Riu Palace Las is situated in the upscale Caracol neighborhood, home to beautiful white-sand beaches, fabulous upscale shopping directly across the street at Plaza Caracol, and the pulse of Cancun's sizzling nightlife within walking distance. Guests enjoy multiple resort activities and entertainment with exchange privileges at nearby sister hotels. 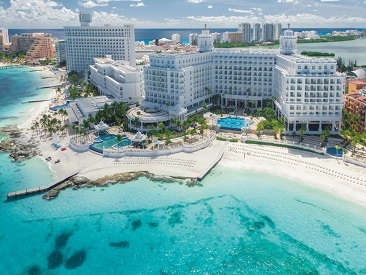 As a guest of the Riu Palace Las Americas, you may enjoy the facilities and dining options at both the adjacent Riu Cancun and the nearby Riu Caribe Cancun (with the exception of à la carte dining venues in the evening). The Riu Cancun is home to the Pacha Disco, open until the early morning six nights a week, and Riu Palace Las Americas guests enjoy entrance and drinks. 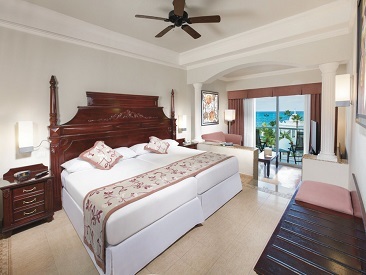 Riu Palace Las Americas provides preferential conditions and additional value to their guests when contacting, booking and paying directly at Riviera Cancun golf course. 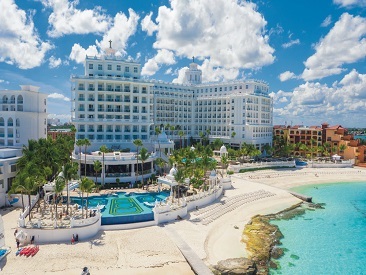 All RIU Palace Hotels offer complimentary Wi-Fi in the lobby and in all guest rooms. You must provide your own transportation to the Riu Caribe, which is only a mile from the resort.